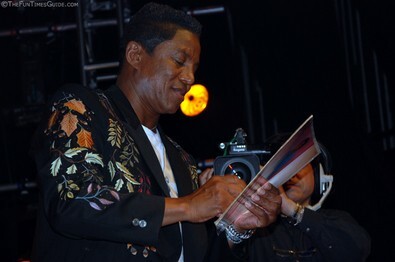 Jermaine Jackson was one of the tamest performers on stage during the final taping for Season 2 of Gone Country. He’s just a low-key kind of guy, that’s all. Jermaine Jackson was fairly entertaining to watch, as he truly tried to "connect" with the crowd. He said at the beginning that was his mission, and he gave it his best attempt. Being in the front row, I can say that he definitely connected with the people up front. I wasn’t quite getting the same "charge" from the crowd behind me as I did with other performers though. That probably had a lot to do with the fact that Jermaine’s song was a mellow one. A good one though. It was called "Loving You Is The Natural Thing To Do". He co-wrote it with Nashville songwriters Billy Lawson and Anthony Smith.